My name is Norm Nieberlein. I have been riding bikes for 30 plus years, the last 13 on recumbents. 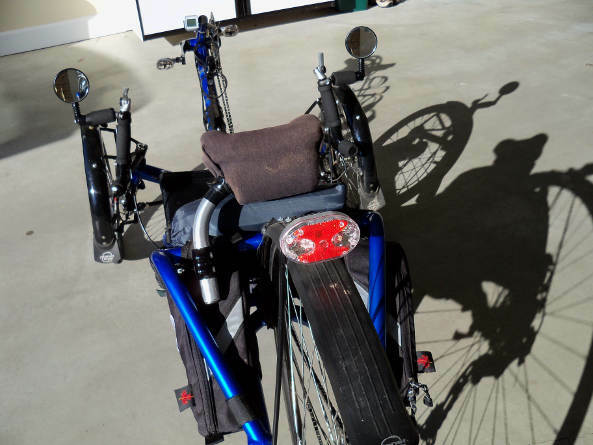 My bike stable consists of: 1) a Gold Rush long wheel base recumbent that I use for long fast rides and also loaded touring, 2) a Bike Friday recumbent that I don’t ride very often, 3) a Cruzbike front wheel drive recumbent that I just purchased. It has a big learning curve to learn to ride it. I’m told it takes about 500 miles to get proficient. And 4) my Catrike 700. 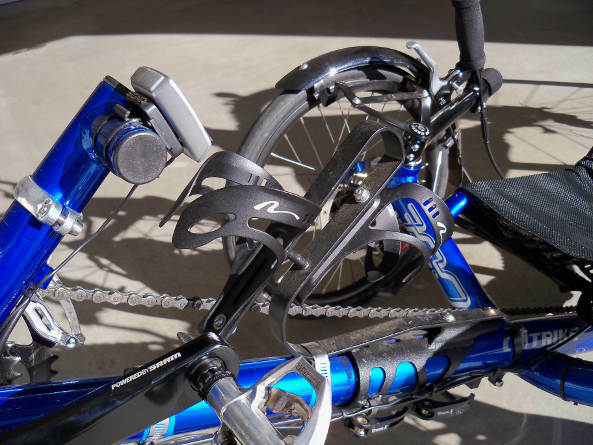 The Catrike 700 is my second recumbent tricycle. It’s fast and comfortable and really a lot of fun. Many fast bicycles sacrifice comfort for speed, but the Catrike does not. 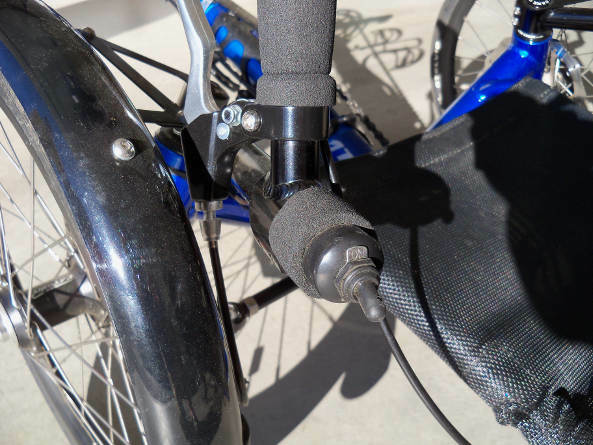 I have made the following four modifications to the trike: 1) mounted water bottles in an upright position on the boom where they are easy to reach. 2) modified a flashing taillight to operate remotely from a switch on the handlebar. 3) The seat is laid way back, which caused neck cramps, and the stock headrest was not satisfactory. So, I purchased one from “Power On” cycling. I modified it with some extra foam and covered it by stretching an old arm warmer over it. Works great, no more neck cramps! 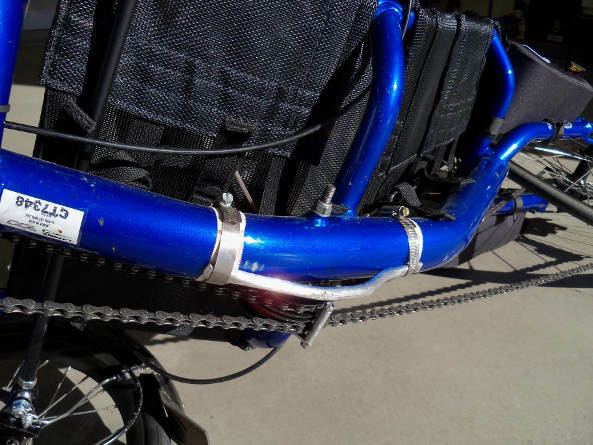 4) The Catrike 700 is quite low to the ground, so I made a skid plate to protect the chain idler pulley. Age is catching up with me, and my coordination and balance are not what they used to be, so I feel safer on the trike than a two wheeler. Besides, its really fun to ride. Actually you don’t ride a trike, you drive it! So what happened to my ICE Qnt, you may wonder? Well, I sold it to a fellow who was a trike newbie, never had had one before. He said he needed a trike to ride to Death Valley, of all places. Sounded strange to me, but he had the money, so I parted ways with the Q to try the 700. Turns out, the guy who bought it had so darn much fun with it on his trip that he started a trike website called Trike Asylum, and then decided to publish a book all about tadpole trikes. You guess his name. Norm wired his lights so that this one switch on the handlebar activates them. Easy on the fly. Here is the custom made dual water bottle holder Norm fabricated. 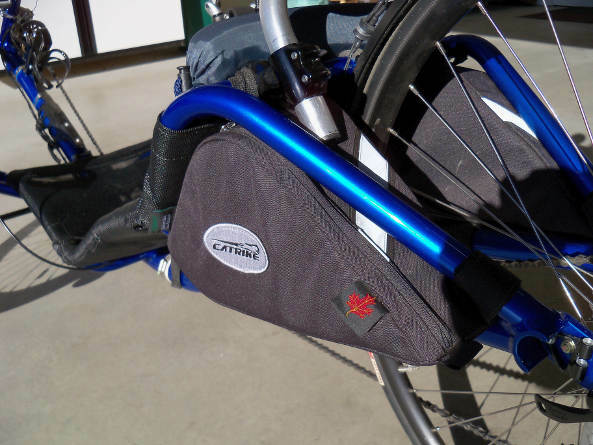 Arkel Catrike frame bags allow for convenient storage on day rides, and help alleviate air drag. The rear taillight mounts on a custom rear fender, and flips on with a handlebar switch. A pre-2013 700, the 16 inch front wheels make low ground clearance, thus Norm’s skidplate! 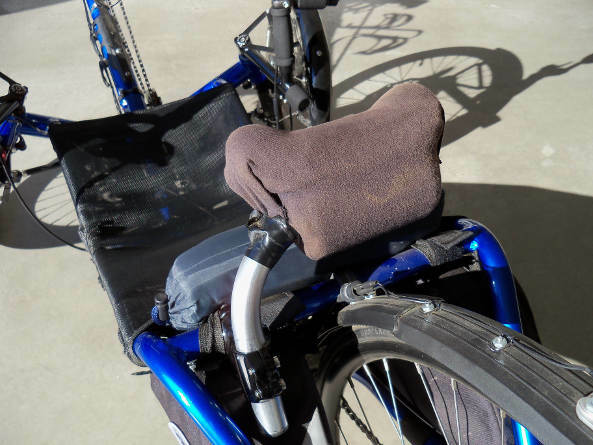 Not happy with the stock Catrike neckrest, Norm, of course, fabricated one that works for him. The “old man” (circa 1935) stays young on his wicked fast Catrike 700 speed trike! Try catching him!